Chapter 1 of 6th grade NCERT social science textbook is titled Understanding Diversity. It introduces students to the ideas of equality, caste system, geographical diversity and cultural diversity. This exercise supplements the Understanding Diversity chapter and allows the students to explore and understand diversity in the Constituent Assembly. The Assembly had 299 members: 229 members elected from 12 Indian Provinces and 70 members nominated from 29 Princely States. They came from varied backgrounds and debated diverse ideas. 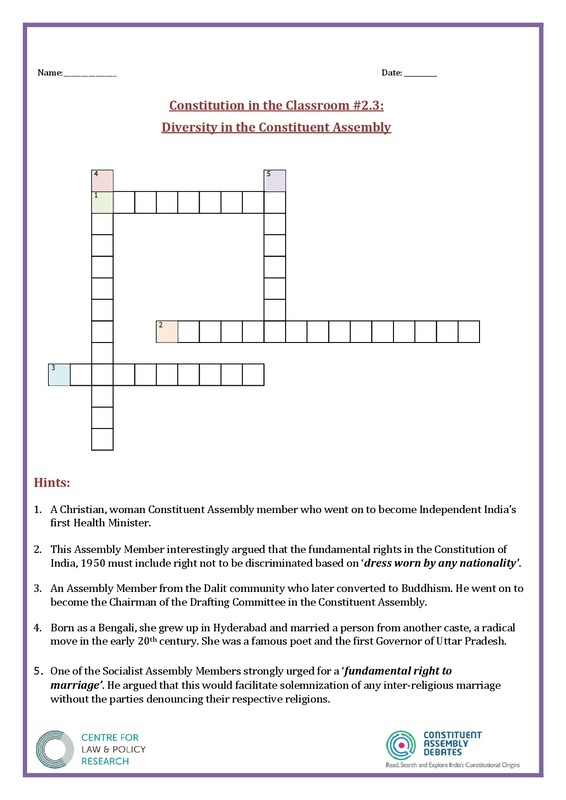 This crossword puzzle hides names of 5 Constituent Assembly Members. Can you find them using the CADIndia website?